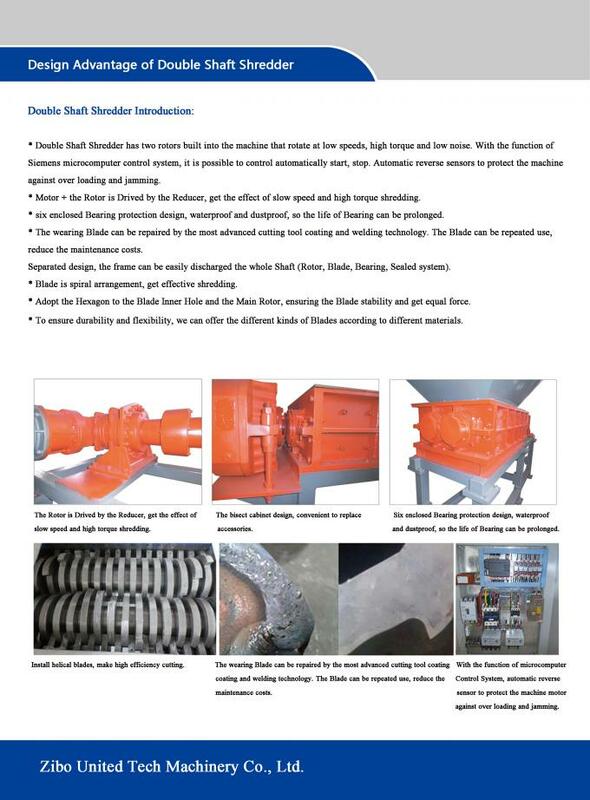 The Tire Shredder/Tyre shredder machine/Tire recycling machine have been designed for a wide array of applications and industries, suitable for shredding solid material such as car tire, truck tire, e-waste, metal, wood, plastic, scrap tires, packaging barrel, pallets, etc. Depending on input material and the following process the shredded material can be used directly or go into the next step of size reduction. 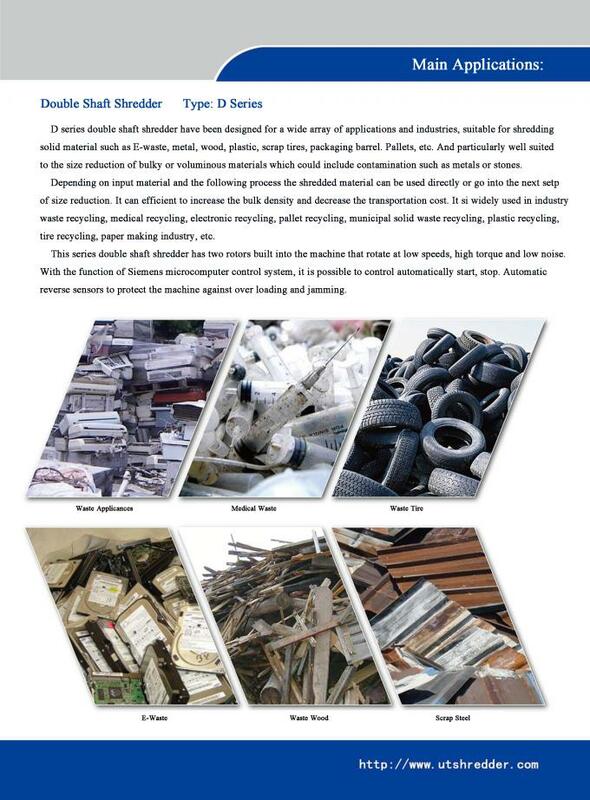 It is widely used in industry waste recycling, medical recycling, electronic recycling, pallet recycling, municipal solid waste recycling, plastic recycling, tire recycling, papermaking industry and etc. 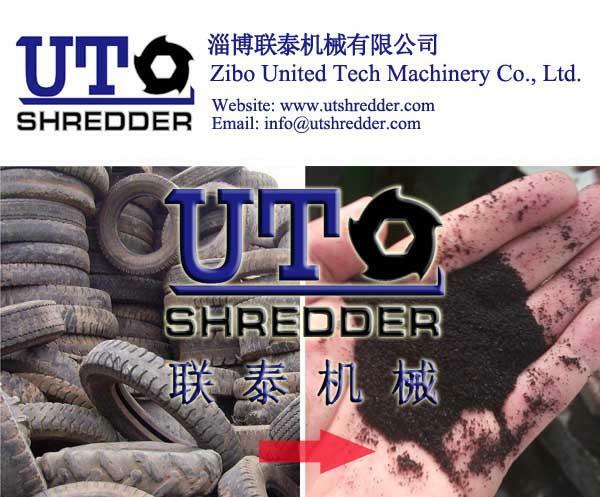 Zibo United Tech Machiner Co., Ltd. --- Tire Shredder/Tyre shredder machine/Tire recycling machine series has two rotors built into the machine that rotate at low speeds, high torque and low noise. Adopt microcomputer control system with function of start, stop, automatic reverse sensors to protect the machine against over loading and jamming. The Tire Shredder/Tyre shredder machine/Tire recycling machine is suitable for crushing the big solid material like television, washing machine, shell of refrigerator, big size pipe, pipe fittings, forklift splint, tyres, packing barrel, vehicle body, aluminum, copper and steel less than 10mm. (1) Your inquiry related to our products or prices will be replied in 24hours. (3) We provide 12 months guarantee since the date of bill of loading. All products are passed strict test. 1. The voltage about the power supply can be selected by the customer’s specific requirements. 2. The shredder capacity can be influenced by the material compostion and output size. What about the quality of your products? 1. we have a special training for each worker. 2. we use China famous brand spare parts to cast the machine. 3. have a trial test run before delivery the machine out of the factory. How about the shipping and package? 1. we arrange shipment usually according to your special requirements. 2. Usually plywood package. Or according to clients's requirements. How to get a suitable machine? 3. the capacity,and power condition. Tell me those data, we can help you choose the Waste type Shredder for you. Please feel free to contact me any time with any questions. (1) Your inquiry related to our products or prices will be replied in 12hours.